Dmitry Rybolovlev’s interest in acquiring US assets is well-known in part because he paid the highest price in American history for a house. Take the tour. Compared to the asking price of $125 million and the transaction price of $95 million, Rybolovlev got a 24% discount. But the asset value of the house has done poorly compared to Rybolovlev’s Uralkali shares. The assessed value of the Miami property dropped about 40% in the twelve months since he bought it. In part also, that 2008 transaction is well-known because it is subject to a freeze order issued in the Geneva canton court in Switzerland in 2010, and filed for enforcement in the Palm Beach County Court. The legal action is part of the recriminations between Dmitry Rybolovlev and his wife, Elena Rybolovleva. She has charged her husband with tilting their asset balance-sheet to her disadvantage – call that asset stripping, concealment or fraud, if you are on her side. The divorce proceedings have been reported in Le Temps of Geneva, after which Swiss reporters have been threatened with libel law attack and contempt of court proceedings if they probe any further. But protected by the US Constitution, an intrepid American reporter, Kyle Finck, has just defied the threats of the Swiss courts and the dangers of getting too close to Rybolovlev’s private parts to investigate how it happened that the potash oligarch bought a Louis Vuitton pen for $398 and on November 10, 2010 — without getting permission from his wife or the courts in Geneva and Miami — passed it for free to the Lieutenant-Governor of the State of California, Gavin Newsom. In the annals of running and hiding cash, the usual pattern is from the US and Russia into Switzerland. There are still unresolved claims by the US authorities against Swiss banks for that direction, as well as claims the Obama Administration is soft on UBS and its US clients. But when Rybolovlev was being shown around San Francisco by Newsom, the welcome mat was out, and apparently lawfully so, for the flow of money in the opposite direction. Should the Californian official have known there was a warrant of sorts out for Rybolovlev’s money many months before he gave him the tour? Every year, California politicians receive gifts from supporters and friends – sports tickets, bottles of wine, trinkets and other items that by law can be worth no more than $420 apiece. For the most part, the gifts are ignored by the press and the public. But every so often, one stands out. Why, for example, did someone give a $398 Louis Vuitton pen to Lt. Gov. Gavin Newsom? The pen is interesting not for its value or because there is evidence that it garnered political influence, but because the donor was a shadowy Russian billionaire who has no known connection to his reported address in San Francisco. After noticing the gift on Newsom’s state disclosure report, California Watch started calling around. The billionaire is Dmitry Rybolovlev, 44, a businessman and physician from Perm in central Russia. In 2010, he was worth approximately $8.6 billion, according to Forbes magazine – the 79th-richest person in the world. The self-proclaimed “fertilizer king,” Rybolovlev made his fortune by acquiring the state-owned potash fertilizer company Uralkali during the 1990s privatization in Russia. Potash is mined from abundant reserves in Russia. Today, Rybolovlev lives in Geneva, Switzerland. His main link to the United States came via a record Florida real estate purchase: In 2008, through an investment company, County Road Property LLC, he bought Donald Trump’s Palm Beach mansion for $95 million. Rybolovlev has a checkered past. In 1996, he was arrested and charged with the contract killing of an influential industrialist, according to a report from the Russian state central information agency ITAR-TASS. “Observers believe the crime is related to the potassium and oil business which involved both the victim and the suspected crime organizer (Rybolovlev),” reported ITAR-TASS. After spending 11 months in prison, he was acquitted for lack of evidence. John Helmer, Russia correspondent for the South African newspaper Business Day, reported extensively on Rybolovlev and Uralkali. He recalled Rybolovlev as a private man. According to Uralkali documents, Rybolovlev gave up majority control of the company in June 2010. Today, he is involved in several partnerships and businesses, including a Geneva-based biotech investment concern called Tilocor Life Science, according to the Swiss weekly L’Hebdo. A recent messy divorce with wife Elena Rybolovlev, who is demanding $6 billion, has drawn unwelcome media attention to Rybolovlev. Rybolovlev has no known ties to California. But on Nov. 18, 2010, the Russian billionaire gave the expensive pen to Newsom, according to a disclosure report Newsom filed. Newsom was mayor of San Francisco at the time and had just been been elected lieutenant governor. As Rybolovlev’s address, Newsom listed an office suite on Sansome Street in downtown San Francisco. It’s actually occupied by a local travel agency. California Watch sought Rybolovlev’s account of why he gave Newsom a gift and how he was connected to the Sansome Street address, but his lawyers declined comment. Officials of Casto Travel, which occupies the business suite listed as Rybolovlev’s address, denied any involvement with the billionaire. They directed inquiries to California Host, an event-planning company that sublets space in the suite. Kyle Edwards, vice president of sales and marketing for California Host, refused to comment on Rybolovlev, saying he doesn’t discuss clients. Newsom spokesman Francisco Castillo provided limited information. In a statement, he wrote: “Mr. 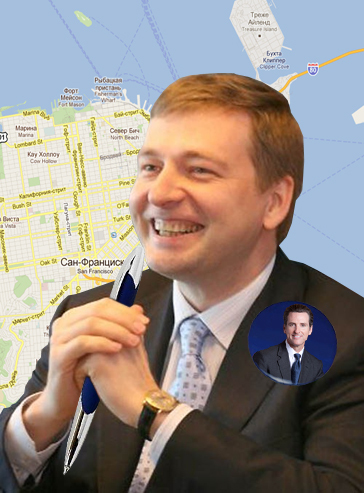 Rybolovlev was one of many business figures that visited San Francisco during Newsom’s term as mayor. The Lt. Governor met with Mr. Rybolovlev, as he often did with many business leaders that visited the city, and gave him a tour of Mission Bay,” the locale of a UC San Francisco research campus and many biotech companies. Castillo declined to reveal how Newsom had met the billionaire or what year the visit had occurred. In response to a records request from California Watch, a spokeswoman for San Francisco Mayor Ed Lee said the city has no documents from Newsom’s term as mayor that mention Rybolovlev. Newsom’s official calendar from fall 2010 doesn’t mention the Russian billionaire, either. On Nov. 18, the day he reported receiving Rybolovlev’s gift, the calendar shows Newsom was in Mission Bay to attend the opening of the headquarters of a new biotech concern, Nektar Therapeutics. A spokesman said the opening was an invitation-only event and Rybolovlev was not on the guest list. “He has no connection with Nektar,” the spokesman said. But Jennifer Matz, director of the city’s Office of Economic and Workforce Development, said she recalled the Russian billionaire. Consulting her records, Matz said that in fall 2010, the mayor’s office requested information on Mission Bay in preparation for a visit by Rybolovlev. Matz said she provided the information on Oct. 13. The Russian’s visit was the following Saturday, Oct. 16. “Our understanding was that the Russian guy was coming to town and was interested in relocating a biotech company in Mission Bay, and the mayor was going to be meeting with him,” Matz said. Matz said she understood the two men spent time together twice: once on their tour of Mission Bay and a second time at City Hall, where Rybolovlev gave Newsom the pen. As mayor, Newsom worked to bring investment to Mission Bay, creating a haven for biotechnology and pharmaceutical companies. But according to Matz, Newsom failed to lure the billionaire to Mission Bay. “I have no idea what his business interests are, and we never inquired because it never got that far,” she said. State law requires politicians to disclose their gifts and other sources of income on annual reports called statements of economic interest. Along with the date, value and description of the gift, officials must report the name and address of the donor. Violators of the act can be fined. Robert Stern, president of the Center for Governmental Studies in Los Angeles, said failing to make an accurate report of a donor’s address is a minor violation of state law. If informed of a violation of this sort, the state Fair Political Practices Commission might resolve it by getting the violator to correct the filing, Stern said. Castillo said all of Newsom’s filings were reviewed by legal counsel. California Watch reporter Lance Williams contributed to this post.